The Fellowship was fortunate enough to obtain a copy of ROCKET SALVAGE #1 from Archaia and BOOM! Studios. Yehudi Mercado writes, Bachan draws and Jeremy Lawson colors. Primo Rocket was the most famous racer on Rio Rojo fifteen years ago. When that career didn’t pan out, he became a deep-space salvage specialist (read: garbage man). He’s raising his kids alone and just trying to get by. But now there are rumors of a lost weapon that could change the face of galactic politics, and they say it’s on Rio Rojo. And Primo is about to get caught in the middle of it. On the surface this looks like a simple “find the widget before the bad guys” story, but there’s a lot more depth here. Sure, there’s politics (I don’t want to risk spoilers), but on top of that Primo’s family is entertaining to say the least. They’re weird and funny and normal, which resonates as a family unit. The art works really well, too; the aliens are different but they don’t stand out so far as to feel unrealistic. It’s a good balance. It’s an adventure story, it’s a spy thriller, it’s a family story, and it might end up a redemption story. How can you possibly pass all of that up? 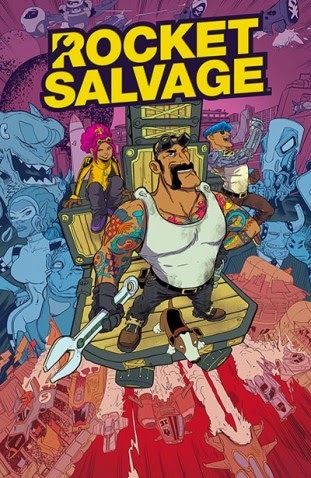 ROCKET SALVAGE #1 is available now at your FLCS or at boom-studios.com.